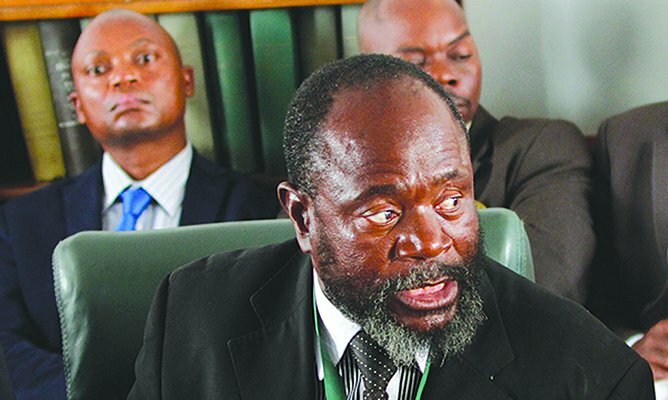 ZANU PF’s Buhera South MP Joseph Chinotimba caused furore in the National Assembly yesterday after calling MDC Alliance leader of the House Thabitha Khumalo a prostitute, leading to her walking out with both parties trading insults which halted business for over 30 minutes. The question and answer session was disrupted for almost 30 minutes as MPs hurled insults at each other over Chinotimba’s utterance, which came as the nation is commemorating 16 days of activism against gender-based violence. “I am shocked that we have MPs that call us names, and Chinotimba just called me a prostitute – this is wrong – no one has a right to call me names. I am not a prostitute, I am an MP and a woman and I want to be respected. He must withdraw or I will take him to court,” Khumalo said. Chinotimba refused to withdraw, claiming that Khumalo was the first to hurl insults at him. Khumalo walked out of the chamber. Female parliamentarians, including MDC women’s assembly chairperson Lynnet Karenyi, recently threatened to approach the courts to report sexual harassment against some Zanu PF lawmakers. Speaker of the National Assembly Jacob Mudenda has instituted investigations into the issues raised by the female lawmakers. Chinotimba then turned on Job Sikhala, (Zengeza West) alleging that the MDC Alliance legislator had called Zanu PF MPs stupid. “I never said those words, however, if he wants me to withdraw that fact that he is stupid then I withdraw,” Sikhala responded. Justice minister Ziyambi Ziyambi had earlier torched a similar storm when he called opposition legislators hypocrites for raising points of order over truancy by ministers during the question and answer session. Ziyambi said ministers could not respond to questions from opposition MPs if they do not recognise President Emmerson Mnangagwa as the appointing authority. “According to the Constitution, ministers are appointed by the President and opposition MPs do not recognise the President – and we cannot continue in this House with hypocrites who on one hand say they do not recognise the President, yet they expect the ministers he appointed to respond to their questions in Parliament,” Ziyambi said. “From today onwards, no minister is going to answer questions from the opposition,” he said. Sikhala said Ziyambi’s remarks confirmed that there was a dispute on the issue of the Presidency. “The minister knows that in terms of the law, there is a de jure and de facto President, and in terms of the Constitution ministers are public servants using taxpayers’ money and you must stop politicking and respond to questions,” Sikhala said. After acting Speaker of the National Assembly William Mutomba ruled that question and answer should continue, Highfield East MP Erick Murai (MDC Alliance) asked Ziyambi to explain measures that government will take to solve the deteriorating situation in the health sector and the doctors’ strike. “I am unable to respond until they (MDC Alliance) recognise the appointing authority,” Ziyambi said. This led to chaotic scenes in the House with MPs shouting at each other. Ziyambi later said doctors were engaged in discussions with the Health minister Obadiah Moyo to end the stalemate. The post Parly chaos as Chinotimba labels Khumalo a prostitute appeared first on NewsDay Zimbabwe.